Demand generation is a critical limiting factor to the growth of many startups. I had the opportunity to moderate a panel of demand generation experts recently at Heavybit, an incubator in San Francisco. I asked the panelists, how well understood is demand generation, considering it is one of the core elements of business needs to sustain its growth? Unanimously, the panel concluded it’s not very well understood. At the outset of every startup that attains product market fit, a collection of innovators adopt the product. They educate themselves, power through early challenges and bugs, and commit themselves to the effort because the startup’s vision resonates with them deeply. In some cases, the startup’s market fit is so good they are able to capture substantial share of the early adopter market purely on word-of-mouth, organic growth and customer interest. However, at some point, the marginal quantity of self educators and early adopters fails to sustain rapid growth. Facing a declining growth rate, the startup has to generate demand in a different way than they have in the past. The next big chunk of buyers require a different sales motion than innovators and early adopters. What does that mean exactly? The chart above is Everett Rogers’s Innovation Diffusion chart, a theoretical segmentation of the buyer market by their proclivity to purchase innovative software. The early and late majority segments comprise 68% of the market, and these buyers don’t buy software the way early adopters buy software. The fattest part of the market often demands more education, more handholding, more social proof through case studies & references, and a relationship with a salesperson or account manager to feel comfortable with the purchase. These buyers might also rely on industry analyst reports like Forrester and Gartner to substantiate a purchasing decision and minimize their career risk. Remember, you’re in the business of selling promotions and many businesses value continuity over innovation. 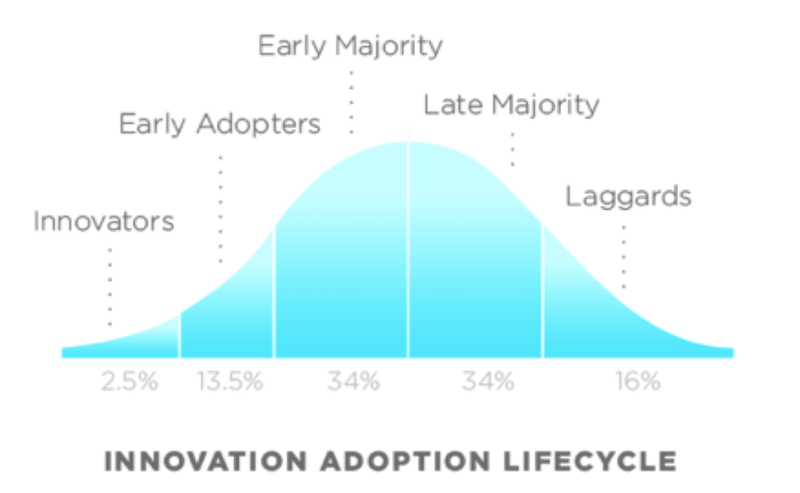 To reach the early/late majority of the software buying market requires different tactics because unlike the early adopters, early/late majority buyers aren’t looking to change. There’s the risk of a failed deployment, the risk of picking a suboptimal vendor, and the risk of budget overruns. Demand generation is about creating urgency in a buyer population that doesn’t currently feel a pressing need to swap their procurement software, their collaboration tools or their business intelligence suite. Why should I consider changing my software? And why should I change it now? Content marketing over the lifecycle of the buyer, webinars, customer events, conversations with salespeople. Industry analyst reports, case studies with notable customers, keynotes with effusive praise from lighthouse customers, key distribution partners. All of these components educate the buying population and attempt to induce urgency. Reaching the majority requires a diversity of different channels. Social media, industry publications, mass media press, search engines and many others. Building a portfolio of these education channels is critical to scaling demand generation. Aided and unaided recall are metrics that are frequently used in the online advertising world but doesn’t yet have broad usage within SaaS demand generation. These recall figures measure what fraction of the population expresses knowledge about a particular brand with and without prompting. The greater number of impressions, be they organic or sponsored, the greater the unaided recall. That metric is a proxy for awareness in the buyer population. After a startup has measured the awareness of their brand within the population and see that is increasing steadily, they then be confident to focus on engendering urgency. Demand generation is a critical function of growing companies especially as the transition from selling to the innovators and early adopters to the biggest part of the market, the early and late majorities.